The battleship Tirpitz conducting trials in the Baltic Sea in the spring of 1941. The Tirpitz, second and last battleship of the Bismarck class, was the largest warship built in Germany. She was commissioned on February 1941, and afterwards went to the Baltic to conduct sea trials. At the beginning of 1942, she was sent to Trondheim, Norway in order to repel a possible allied invasion, and to attack the Russia-bound Arctic convoys. As part of the "Fleet in being", her mere presence forced the Allies to maintain a considerable force in Scapa Flow that could have been otherwise employed in other theatres of operations. In July 1942, she was indirectly responsible for the destruction of convoy PQ-17 without firing a single shot. In September 1943, while anchored in Kåfjord/Altafjord, she was attacked by British midget submarines and put out of action for the first time. Later subjected to continuous aerial bombings, the Tirpitz was finally sunk off Håkøy Island near Tromsø on 12 November 1944 after being hit by 5.4-ton "Tallboy" bombs. 14 June 1936: Building contract placed. 02 November 1936: Lay down on Slipway 2 at the Kriegsmarine Werft shipyard in Wilhelmshaven. Construction number S 128. 01 April 1939: Launched. Christened by Frau von Hassell, daughter of Grand Admiral Tirpitz. 25 February 1941: At 1140 hours, the Tirpitz is commissioned under Captain Karl Topp. 09 March 1941: Leaves Wilhelshaven for Kiel. 10 March 1941: Tirpitz anchors in Brunsbüttel roads. 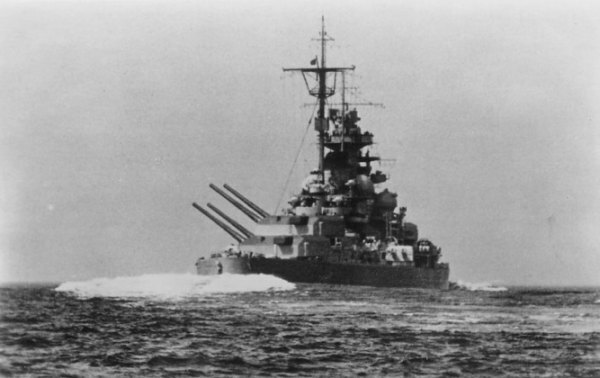 11-12 March 1941: Tirpitz passes through the Kiel Canal. 13 March 1941: Departs Kiel eastbound for Gotenhafen escorted by Sperrbrecher 18 and destroyer Z26. 14 March 1941: Arrives in Gotenhafen and moors at Seebahnhof. 20 March 1941: Begins her trials in the Baltic with base in Gotenhafen. 05 May 1941: Adolf Hitler visits the Tirpitz in Gotenhafen. 22 May 1941: Leaves the Baltic and sails back to Kiel to complete her outfitting. 21 July - 02 August 1941: Drydocked at Deutsche Werke Kiel (Dock C). 02 August - 17 September 1941: At Kiel. 23-26 September 1941: As flagship of the "Baltic Fleet" under the command of Vizeadmiral Otto Ciliax, the Tirpitz remains off Aaland Island with the heavy cruiser Admiral Scheer, the light cruisers Köln, Nürnberg, Emden, Leipzig, destroyers Z25, Z26, Z27, and torpedo boats T2, T5, T8, T11, to prevent any sortie of the Soviet fleet based in Leningrad. 27 September 1941: Arrives in Gotenhafen and moors at Seebahnhof. October 1941: While in Gotenhafen, the antiaircraft battery is increased. In addition two quadruple torpedo mounts are installed on the upper deck to each side of the ship amidships (section X). 01-09 November 1941: Drydocked at Deutsche Werke Kiel (Dock C). 09-30 November 1941: At Deutsche Werke Kiel. 21 December 1941 - 10 January 1942: At Gotenhafen. 11 January 1942: Arrives in Kiel. 12 January 1942: Leaves Kiel for Wilhelmshaven. 12-13 January 1942: Passes through the Kiel Canal en route to Brunsbüttel. 14 January 1942: Arrives in Wilhelmshaven. Operation Polarnacht. At night leaves Wilhelmshaven escorted by the destroyers Richard Beitzen, Paul Jacobi, Bruno Heinemann, and Z29, and sails to Trondheim. 16 January 1942: Arrives in Trondheim and anchors in the Fættenfjord a subsidiary arm of the Åsenfjord. 17 January-5 March 1942: Remains in Trondheim. 30-31 January 1942: Seven British Stirlings of the No. 15 Squadron and nine Halifaxes of No. 76 Squadron, attempt to attack the Tirpitz in Fættenfjord but fail to locate the battleship. 24 February 1942: C-in-C of Battleships, Vizeadmiral Otto Ciliax, with staff embarks. 06 March 1942: At 1200 hours the Tirpitz casts off from Fættenfjord and leaves Trondheim under the command of Vizeadmiral Otto Ciliax, together with the destroyers Z25, Hermann Schoemann, and Paul Jacobi, in order to intercept the British convoys QP8 (with 15 ships) and PQ12 (with 16 ships) in the Arctic. In the afternoon she is sighted off the coast by the British submarine Seawolf. 07 March 1942: At 1800 hours, the Russian steamer Ijora is torpedoed and sunk by the destroyer Friedrich Ihn. 08 March 1942: In the afternoon, Vizeadmiral Ciliax decides to cancel the operation and return to Trondheim. 09 March 1942: Shortly after 0900, while en route to Trondheim, the Tirpitz is attacked by 12 Albacore torpedo biplanes of the 817th and 832th Squadrons from carrier Victorious. The battleship successfully avoids all torpedoes and shoots down two Albacores. At 1957 hours in the evening she anchors in Bogen Bay near Narvik. 10 March 1942: Until 0500 hours, Tirpitz transfers 1,422 tons of fuel-oil to the destroyers Z25, Z7 Hermann Schoemann, and the torpedo boats T5 and T12. Later between 1300 and 1600 hours, transfers another 300 tons to the destroyer Friedrich Ihn. 12 March 1942: Tirpitz weighs anchor at midnight and heads for Trondheim. 13 March 1942: At 2100 arrives in Trondheim and anchors in Fættenfjord. 30-31 March 1942: 33 Halifax bombers attempt to attack the Tirpitz in Fættenfjord without success. Six bombers are lost in the attack. 27-28 April 1942: Attacked by 29 Halifax and 11 Lancaster in Fættenfjord without success. Five bombers are lost in the attack. 28-29 April 1942: Attacked again by 23 Halifax and 11 Lancaster in Fættenfjord without success. This time two bombers are lost in the attack. 31 May 1942: At 1938 hours, the Commander-in-Chief of the Kriegsmarine, Grand Admiral Erich Raeder embarks and spends the night aboard. Grand Admiral's flag is hoisted. 01 June 1942: Grand Admiral Raeder disembarks at 0856 hours. 02 July 1942: Operation Rösselsprung. At 1800, the Tirpitz leaves Trondheim under the command of Admiral Otto Schniewind and sails North, together with the heavy cruiser Admiral Hipper, the destroyers Friedrich Ihn, Hans Lody, Karl Galster, Theodor Riedel and the torpedo boats T7 and T15. Their mission is to join in Altafjord with the battle group from Narvik under the command of Vizeadmiral Oskar Kummetz and comprised of the heavy cruisers Lützow (ex-Deutschland) and Admiral Scheer, and the destroyers Z24, Z27, Z28, Z29, and Z30 to attack the convoy PQ17 with 36 merchantmen. During their voyage to Altafjord the destroyers Hans Lody, Karl Galster, and Theodor Riedel of the Tirpitz group run on to rocks and are discarded for the operation. The Lützow also runs on to rocks and returns to Narvik. 04 July 1942: Tirpitz's group joins Admiral Scheer's in Altafjord. At 2215 hours PQ17 scatters. 05 July 1942: At 1100, Tirpitz, Scheer, Hipper, the destroyers Friedrich Ihn, Richard Beitzen, Z24, Z27, Z28, Z29, Z30, and the torpedo boats T7 and T15 leave Altafjord. The Soviet submarine K-21 attacks Tirpitz with torpedoes at 1702, but obtains no hits. At 2130 the Germans cancel their mission and return home. In the end the German battle group does not engage the enemy, but the Luftwaffe and the U-boats manage to sink 22 merchantmen carrying 430 tanks, 210 planes, 3,350 vehicles and over 99,000 tons of material. 08 July 1942: The Fleet enters the Ofotfjord and anchors in Bogen Bay near Narvik. 23 October 1942: Tirpitz departs Bogen and sails South to Trondheim for a refit. 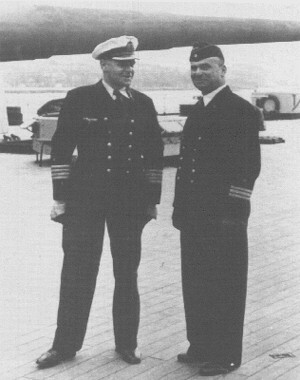 24 February 1943: Captain Hans Meyer takes over command of the ship. 11-12 March 1943: Leaves Trondheim northbound for Narvik escorted by destroyers Karl Gaster, Paul Jacobi and Erich Steinbrinck, and four torpedo boats of the 3rd Flotilla. In Bogen Bay, Tirpitz joins the Scharnhorst and the heavy cruiser Lützow. 13 March 1943: Admiral Kummetz assumes command of the Task Force in Narvik, with Tirpitz as flagship. 13-23 March 1943: Anchored at Bogen Bay near Narvik. 06 September 1943: Operation Sizilien. Tirpitz, Scharnhorst, and the destroyers Z27, Z29, Z30, Z31, Z33, Erich Steinbrinck, Karl Galster, Hans Lody and Theodor Riedel, leave Altafjord under the command of Admiral Kummetz, to attack the allied installations on the island of Spitzbergen. 08 September 1943: The German battle group bombards Spitzbergen and destroy the port facilities. 09 September 1943: The German ships arrive safely at Altafjord and the Tirpitz anchors in Kåfjord. 22 September 1943: The Tirpitz is attacked by the British midget submarines X-5, X-6, and X-7 in Kåfjord. After passing through the protective torpedo nets, X-6 places two mines of two tons each under the battleship's keel, and X-7 another one. The three midget submarines are sunk but the damage sustained is important and the battleship is out of action for the next six months. As a result of this attack 1 man loses his life and 40 other are wounded. November 1943-February 1944: Repair work in Altafjord. 12 February 1944: Attacked by four Soviet bombers in Altafjord without success. 15 March 1944: Begins her trials in Altafjord. The Tirpitz in Kåfjord/Altafjord photographed by a British Mosquito on 12 July 1944. 01 July 1944: Ready to begin her trials again. 31 July-01 August 1944: Conducts her last trials with the destroyers Z29, Z31, Z33, Z34, and Z39. 22 August 1944: Attacked by 32 Barracudas from carriers Indefatigable, Furious, Formidable, Nabob, and Trumpeter with no success. 24 August 1944: Attacked by 33 Barracudas from carriers Indefatigable, Furious, and Formidable. Two hits. 8 dead and 13 wounded. 29 August 1944: Attacked by 26 Barracudas, with no success. 15 September 1944: Attacked by 27 Lancaster from Yagodnik near Archangel. Tirpitz is hit on the forecastle by a 5.4-ton "Tallboy" bomb. The damage is severe and the battleship is no longer seaworthy. 15 October 1944: After temporary repairs in the bow, the Tirpitz leaves Kåfjord/Altafjord and sails at 8 knots to Tromsø where she anchors off Håkøy Island to remain there as a floating battery. 29 October 1944: Attacked by 32 Lancaster of the 617th Dam Buster Squadron without success. 12 November 1944: Attacked by 32 Lancaster. Shortly after 0940, the Tirpitz is hit by two "Tallboy" bombs on the port side amidships. Four other bombs near-miss the battleship. At 0952 the ship capsizes in position 69º 38' 49" North, 18º 48' 27" East (see the map below). 971 dead. 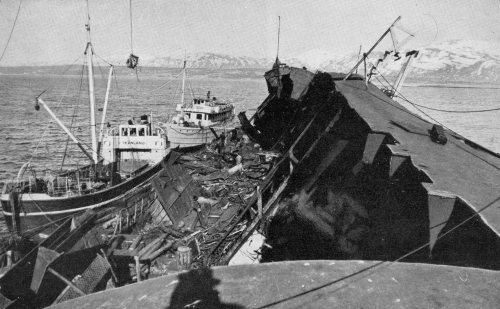 1948-1957: The wreck of the Tirpitz is broken up by British, Norwegian and German firms. 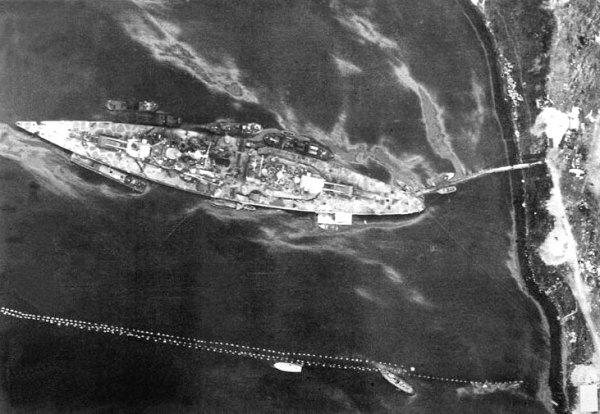 The wreck of the Tirpitz being broken up. The Tirpitz as she looked in 1941-early 1942. The Tirpitz in March 1944 while in Norway. 25 February 1941 - 24 February 1943: Kapitän zur See Karl Topp. 25 February 1943 - 30 April 1944: Kapitän zur See Hans Meyer. 01 May 1944 - 03 November 1944: Kapitän zur See Wolf Junge. 04-12 November 1944: Kapitän zur See Robert Weber. Displacement: standard 43,900 mt, full load max. 53,500 mt. Dimensions: Waterline length 241.72 m, overall length 253.6 m, beam 36 m, maximum draft 10.61 m, depth 15 m.
Armour: main belt 320 mm, main turrets 130-360 mm, upper deck 50-80 mm, armour deck 80-120 mm, conning tower 220-350 mm, torpedo bulkhead 45 mm. • 8 x 38cm SK C/34 guns in four double turrets. • 12 x 15cm SK C/28 guns in six double turrets. • 16 x 10.5cm SK C/33 guns in eight double mounts. • 8 x 53.3cm torpedo tubes in two quadruple mounts. • 5 x 10.5-m base rangefinders. • 1 x 7-m base rangefinder. • In 1941: 3 x FuMO23. • In 1942: 3 x FuMO23, 1 x FuMO27, FuMO 4 Samos. • In 1944: 3 x FuMO26, FuMO Hohentwiel, FuMO213 "Würzburg-D". Seaplanes: 4 x Arado ar 196. Propulsion plant: 12 Wagner boilers, three Brown Boveri turbine sets, 163,026 hp (maximum obtained). Speed: 30.8 knots (maximum obtained). Endurance: 9,280 nm at 16 knots, 8,870 nm at 19 knots, 6,693 nm at 24 knots, 4,728 nm at 28 knots. Crew: 2,608 (108 officers and 2,500 men). The Attack on the Tirpitz by midget submarines on 22nd September, 1943. Bismarck & Tirpitz Book Series, by Robert Gehringer and Antonio Bonomi.